The Sedimentary Geochemistry Laboratory houses instrumentation for determining selected elemental concentrations and for preparing samples for stable isotopic analysis. It is equipped for analysis of total organic and inorganic carbon concentrations by (2) UIC carbon coulometer(s), FeS (acid-volatile sulfide) and pyrite sulfur extractions for concentrations and isotopes (chromium reduction-AVS extraction line), carbonate-associated sulfate (CAS) and barite extractions for d34Ssulfate and d18Osulfate, concentrations of various iron phases (Na-dithionite Fe, HCl-soluble Fe, pyrite Fe, carbonate Fe, and total Fe), dissolved sulfate concentrations (ion chromatography), H2S concentrations, and concentrations of various phosphorus phases (SEDEX method) via Shimadzu UV-vis spectrophotometer. 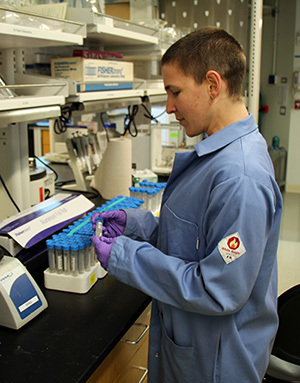 Instrumentation in the lab was recently upgraded with a grant from the NSF-IF program.